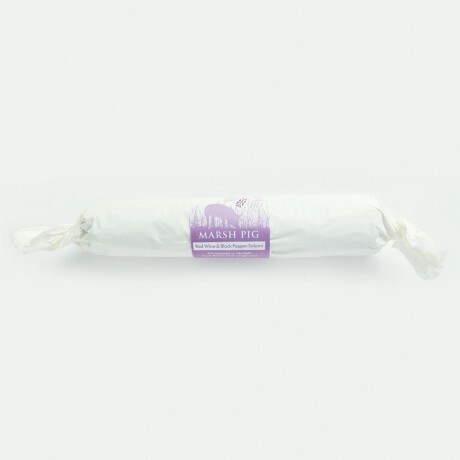 This salami is one of Marsh Pig's best sellers. Red wine adds va-va-voom to almost any recipe and this salami is no exception, with the flavour beautifully accentuated by black peppercorns too. This is a whole salami, so you can nibble as much or as little as preferred. Once you have sliced what you want simply, place in an air tight container in the fridge. Free range pork 95.1%, salt, black pepper, red wine, garlic, fennel seeds, dextrose, preservative (sodium nitrite).